Thick and Tired? Tame your mane with super conditioning. Have a .... GLAD HAIR DAY (for Full, Frizzy or Fried Hair) It is the INTENSIVE CONDITIONER. For glossy, shiny, more enviable tresses, squeeze excess water from your hair after shampooing, rub a walnut-sized dollop onto your roots, extend through lengths and ends, and let it all soak in for a minute - literally. Rinse well, comb through, and style as usual. The fruity fragrance (tutti-fruitty) was indeed a mega plus as it did leave my hair smelling sweet and lush. It left my hair very soft and my hair didn't feel as dry as it sometimes can be. It's 50ml so if you use the right amount you could get at least 4-7 washes out of a travel sized. 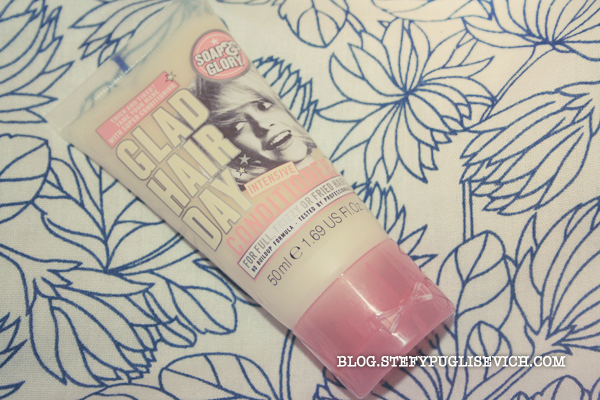 Pairing this with the GLAD HAIR DAY SHAMPOO my hair did feel ever so soft and silky. I would truly recommend to anyone wanting to try a new product.